Jonathan played his youth hockey with the AAA L.A. Selects. He is presently on the roster of the AHL Rochester Americans. Daryn Goodwin’s NARCh – with its World Series of Roller – put together a phenominal 20-season look at its players, teams and championships. Go to the home page, scroll down lower left. Look closely and you will spot some Las Vegas Tour Rebels in some of the frames. Chris will begin his 4th season this fall with the Las Vegas Wranglers. Entering into his third season as head coach of the UNLV “Rebel” Hockey Team, J.J. Hartmann is extremely passionate and enthusiastic about the upcoming season. J.J., along with his staff, entered the coaching arena at UNLV in late November of 2012. J.J. feels this next season looks very promising with number of last season’s players returning and a new recruiting class of skilled players. J.J. brings strength of character and ethics as well as his extensive experience in hockey. As as graduate of Denver University, J.J. was a four-year varsity lettered player with Denver in the NCAA Div. I / WCHA. After his graduation, J.J. player professionally with the San Diego “Gulls” and the Long Beach “Ice Dogs” in the ECHL. So far Chris Francis of Las Vegas 3 goals, 8 assists in four games for the defending NARCh Pro champions Revision Vanquish roller team. Today Chris and Revision take on powerful Pama Cyclones of L.A. in a Final 8 game at the Hershey Centre in Mississauga, Ontario, Canada. Pama is at NARCh Pro with some new players and a “new look” according to their head coach. That was Las Vegas goal scorer Adam Naglich, heading to Hungary, bumping into coach Rob Pallin, doing the same, at McCarron Airport in Las Vegas yesterday afternoon. Adam signed a contract to play on coach Rob’s new team. The powerful Alkali RPD NARCh pro team out of Southern California gets final instructions before playing in a NARCh Nationals game at the Hershey Centre in Mississauga, Canada. Chris Francis is the only Las Vegas skater playing in NARCh Pro in Canada this weekend. He has one goal, four assists in his first two games for defending champion Revision Vanquish whose home rink is in Irvine, California. Chris plays two games with Revision today, then the field gets reduced from 17 to 12 teams for the playoffs which begin Friday night at the Hershey Centre in Mississauga, Ontario, Canada. In the last three seasons with the ECHL Las Vegas Wranglers, Chris has scored 41 goals, dealt 63 assists for 104 points. He begins his 4th season with the Wranglers this fall. Troy Redmann, the goalie who years ago played for the AAA L.A. Jr Kings, is in the net for the powerful Labeda Snipers NARCh pro team. Troy, from Brea, California, last season played two games in the ECHL with the Ontario Reign. Troy is 27. Tommy Tartaglione was a top goalie years ago for the AAA Cal Wave. He is playing at NARCh Pro with Mission Next Generation. As a junior player, Tommy, 25, played for the WHL Vancouver Giants, Regina Pats, Prince George Cougars and BCHL Surrey Eagles. Tom McCollum of Revision Vanquish won Best Goalie at the NARCh skills competitionlast night. Meanwhile, the awesome Akali RPD pro team won its first two games, 9-1, 9-1. Rob Proffitt, GM of the NAHL Fairbanks Ice Dogs, returns as head coach of the AAA Fairbanks Arctic Lions 16u hockey club this fall. The Las Vegas Wranglers have a Countdown Clock ticking….85 days until Opening Night when the Utah Grizzlies invade The Orleans Arena on Tropicana Ave.
Today is the day — seven-time Vegas Hockey Coach of the Year Rob Pallin heads to his new coaching job in Hungary. He has a flight in Las Vegas which connects to Minnapolis, then to Amsterdam, then to Budapest. Adam Naglich, who played for Pallin years ago with AA Las Vegas Mustangs at the Santa Fe Stations Ice Arena, is on the same team as well. Rob will be reunited with a close friend, Marty Raymond, who is head coach of Sapa Fehervar in Hungary. Rob will be the number one assistant handling powerplay units and on game nights, sending out the defensive pairs. Pallin will also be coaching Hungary’s 20u national team. Mississauga, Ontario, Canada – Chris Francis, the big goal scorer for the Las Vegas Tour Rebels roller team, will be skating at the NARCh Nationals for the defending champions Revision Vanquish pro roller team which begins play today at the Hershey Centre. Francis, the leading goal scorer for the Tour Rebels at the recent AAU Jr Olympic Championships in Huntington Beach, Ca., was invited to skate with Revision after that tournament. There are 17 pro teams in the field including the famous Pama Cylones of Los Angeles. Twelve teams will advance to the playoffs. Thomas McCollum, drafted by the NHL Detroit Red Wings in 2008, got the shutout win. McCollum recently signed to play with the AHL Grand Rapids Griffins this season. 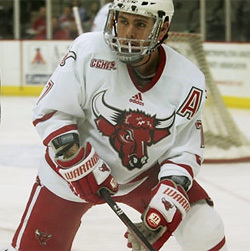 One of the top Revision skaters is Derrick Burnett who played four seasons with the Air Force Academy. Derrick is from Corona, Calif.
An elite skater, Travis Noe, is playing for Alkali RPD which is a top team based in Mission Viejo, California. The pro field includes Mission Next Generation, Tour Mudcats, Mission LaBeda Snipers and the Pama Cyclones of Los Angeles. Chris shook loose on a breakaway and put the puck low blocker. //Chris Francis 3 assists as Revision Vanquish finishes 3-1-0 in round-robin and is seeded #4 in a field of 12 playoff teams.